El desarrollo de este tanque pesado experimental comenzó en septiembre de 1944. La construcción y pruebas de los prototipos continuaron hasta octubre de 1947, sin embargo, el T29 nunca se produjo en serie. Good gun depression that works well with the hull down philosophy. Great view range for the heavy tank class. 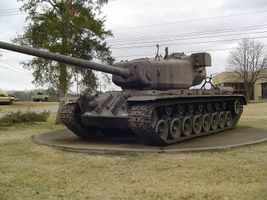 Large tracks with some armor backing and no sponsons make the T29-style hull near the best for sidescraping techniques. Large silhouette from all angles - although this is not a problem from the front. Excruciating stock grind if coming from the Sherman Jumbo. Expensive ammo for its top gun; matches will soon result in negative income without a decent damage dealt/damage taken ratio. 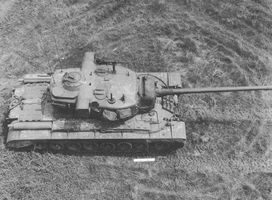 The T29, although capable of leading an assault, can be very hard to coax out of a defensive position if it keeps its hull hidden and only exposes its strong turret. If put into a tier 8 or higher battle, it will have considerable difficulty avoiding damage unless it is put in a hull-down position. The turret armor can bounce almost any shell and fight back with good results. The T29 does need to attempt to keep all of it's opponents inside of a relatively small arc in front of its armor to control the fight though. The T29 is somewhat slow although its acceleration is acceptable once the engine has been upgraded, making it somewhat less swift than German/Russian offerings on flat ground but not behind most player packs. Therefore, it is highly advised to research the 90mm gun first and then research mobility upgrades to increase responsiveness. 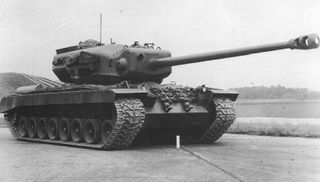 If you did not research the 90mm gun on the M6, and you have no free exp to use, then this tank virtually hamstrings teams it is on by preventing a (typically high on the battle listings) heavy from performing a key aspect of its role against its equals on the other team. However, the T29 starts to shine the moment you upgrade its tracks and turret even with just the 90mm. Once you upgrade the turret, it gains a rate of fire increase on the 105mm gun, and a boost to viewrange from rangefinders that may appear to increase vulnerability but were removed from the hitbox in 2011. With the HP increase, the T29 feels like the tank it should be with the 2nd turret irregardless of whether it mounts the 90mm or 105. The 90mm Gun carries over from the M6 (or if you previously played the T20) and should be installed immediately. The 76 mm is insufficient for anything at this tier. Free XP is strongly recommended if you came from the E2 Jumbo Sherman and don't have the 90mm M3. First, research the upgraded suspension, as it makes the T29 more durable to tracking shots and gives it the ability to mount the heavy 105mm cannon. Next, research the second turret, as it will reduce the reload time of the 105mm gun, as well as useful increase in view range. The rangefinder additions and gun-model additions are a boost to its historical appearance. In no particular order, research the engines and the 105. This improves acceleration and especially hillclimbing speed, assisting movement to get into ideal hull-down or other exploitable positions faster. With the gun, penetrating and damaging protected enemies will be simplified by a 38mm increase in penetration.